My first encounter with a pistachio nut happened sometime in elementary school, when I witnessed a friend snapping open the shells of an unfamiliar nut. 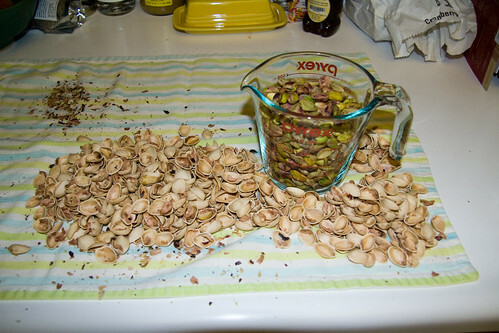 I became fixated on salted pistachios for some weeks after that, delighting in the precise shellingâ€”far superior to messy peanutsâ€”and always chagrined to find one that was too tight to open. I also loved the taste. 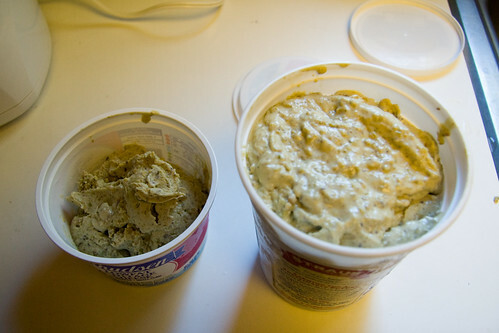 To this day pistachios appear in some of my favorite foods, both sweet (baklava) and savory (country pÃ¢tÃ©), to say nothing of the perfection which is pistachio ice cream. 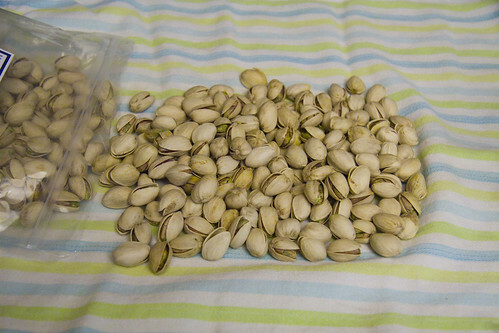 Realizing that homemade ice cream was easily in reach, and armed with instructions from the Silver Spoon, I set out to find a large bag of pistachios at the Farmers’ Market. I found them from Fiddyment Farms, a Roseville based pistachio grower that offers a plethora of pistachio products, along with plain freshly picked and roasted nuts. A two pound bag was adequate for my experimentation and snacking needs. 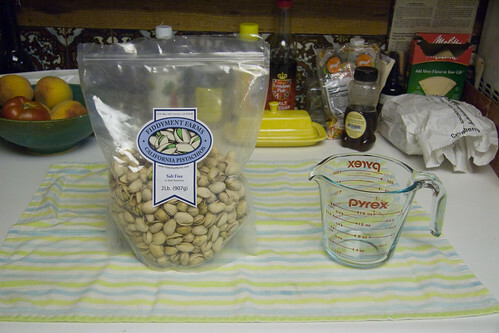 I began by painstakingly shelling two cups of nuts. I considered removing the papery inner skins, but thought better of it after realizing how tightly they clung to the nut. 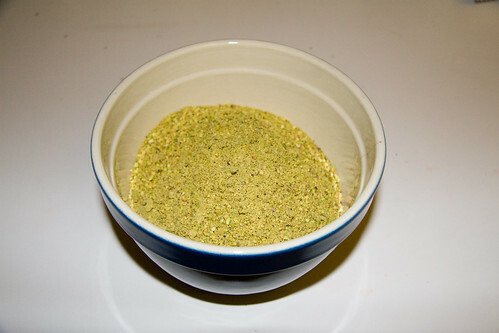 I threw the shelled pistachios into the food processor and ground them into a fine meal. This was actually a second attempt at ice cream, because my first attempt never got creamy and was more like frozen milk. 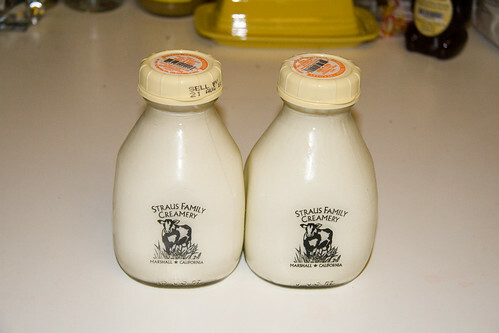 Believing that the original problem might have been my use of whole milk rather than a thicker cream, I decided to make the second batch with Strauss Half and Half. Strauss, without question, makes the best milk and cream I’ve tasted. 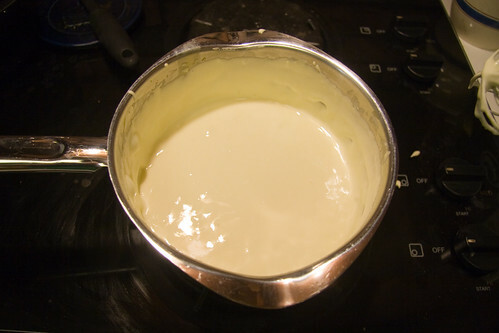 I poured the cream into a pot and slowly heated it to a boil. Once the cream boiled, I removed it from the heat and added it to the pistachios, then let this sit while I dealt with the eggs and sugar. As a young child allergic to eggs, I learned the hard way that really good homemade ice cream usually entails significant quantities of them. Fortunately, in the intervening years, my allergy has both lessened, and I’ve learned that the important part of the egg is the yolk, which brings me no harm. This recipe called for a heart-threatening eight egg yolks. I placed the egg yolks and a cup of sugar into the pot, and whipped them like crazy until they became very fluffy and pale. 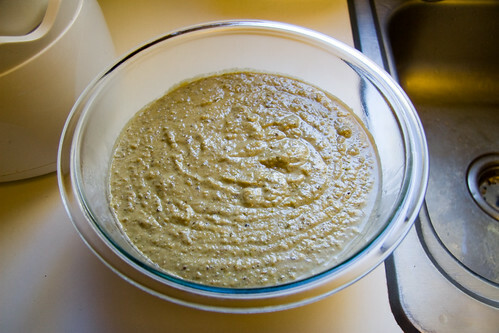 This, I realized later, was where I had actually gone wrong with my first batch. Unfortunately, my kitchen lighting is imperfect, so it may be hard to accurately note the color change in the photos, but if you follow this, be sure to whip the eggs for a long time. 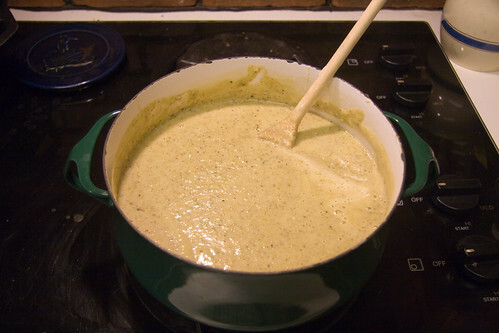 With the yolks as pale as I could get them, I poured the warm cream and nut mixture into the pot. 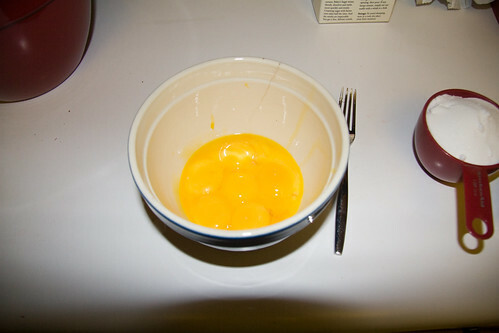 The yolks immediately rose in the pot, in a transformation that seemed almost like a flower blooming. This was the moment I suspected that the eggs were key to the ice cream, as it didn’t happen the first time. 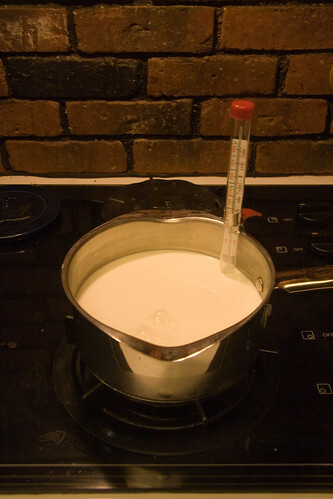 I stirred the mixture together the applied a low flame to slowly bring it to a boil, stirring the entire time. 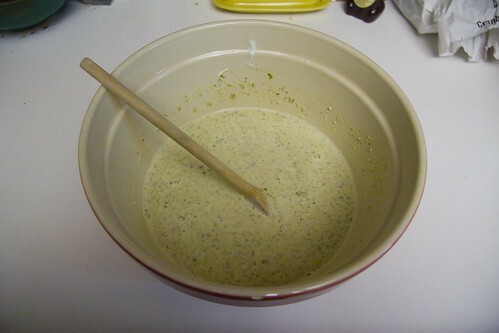 As soon as the ice cream boiled, I remove it from heat, and transferred it to a large bowl to cool. At this point, it pretty much looked just like melted ice cream, a good sign. 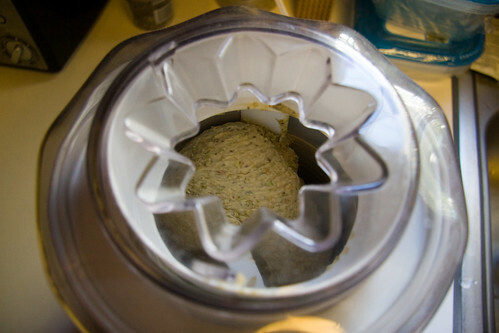 Once the ice cream was fully cooled, the next day in this case, I poured it into an ice cream maker, and watched it freeze. We had enough ice cream to fill two containers, one for us and one a thank you gift to our friends who lent the ice cream maker. 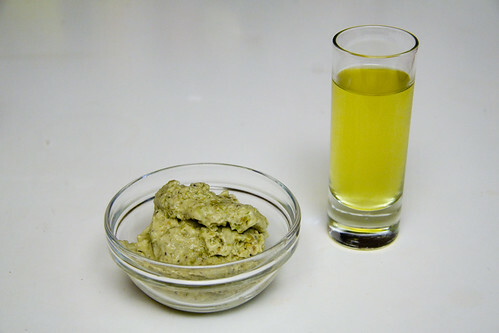 We enjoyed our first scoops of pistachio ice cream alongside a homemade limoncello, a perfect Italian dessert pairing.